As you know me and the Mr are in full wedding planning swing which means picking dates and thinking of the important things like who we want there with us and after those big decisions comes one thing...invitations of course. Now this can be a stressful and expensive experience. You want your invitations to give a sneak peak into how exciting the big day is going to be. A lot of brides save money by hand making them all from scratch and while this adds a lovely personal touch can still come in pretty pricey after getting all the materials together. So when I found paperless post I was super happy. 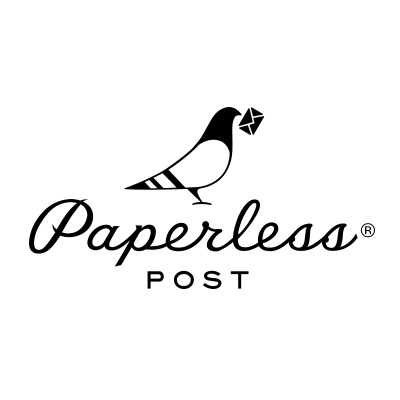 Paperless post works with designers like Kate Spade, Oscar De La Renta and Vera Wang bringing you on trend beautiful pieces. I was blown away with the amount of stunning designs to choose from and anyone with a love of stationary will be in heaven. There are a full palette of colours to choose from and you can choose to have your invitation online or posted. If they are posted then you even get matching envelopes and we all know a theme is important just imagine a pretty envelope falling through your loved ones doors. The customisation on the invitations varies you can play with colours and choose if you want your letters pressed or printed through thermography so the details are really took into consideration. Making every element of your special day that bit more real. Paperless post wedding invitations changes the way you connect with your wedding guests and just look at the work that goes into these gorgeous designs. If you haven't nailed out the details yet but want people to save the date there are also lots of save the date themes to choose from. You can even match up your later invitations so they stay along the same theme. You can see the price per invitation which can be handy if you sent out a bulk amount and then realised you forgot to include your great aunt. You can just jump on and manage your mailbox to make sure they were all sent out. Having an online management system is so handy and if you need that extra help with keeping organised you can keep all your stationary needs all in one place. I found it all really easy to use you pick a design change the details over to the ones that you want and you can save and even send out. You have a place where you can put all your addresses in one place which is completely confidential and then you have all your families details stored ready for any birthdays because you can send cards too! You can even design your menus, bridal showers and programme for the day too. You can choose to keep them all the same style and as your old designs are stored for you to look back on you can easily match them up with the same designer or style. Equally if you change your theme completely no problem everything is easily changed. I love how much control this gives yo over your day and it is so stress free because lets face it you will already have enough on your plate to deal with. If your not getting married or just loved paperless post so much that you want to use it everywhere well they also got you covered for cards, invitations and even personalised stationary. They have a gorgeous Halloween range right now which makes me long to have a party just so I can send out the awesome invites. I am so excited to start my love affair with this brand and I hope you are too! Have you checked out Paperless Post yet?